Thrifty is a mum of 3 who is passionate about living a happy, simple and frugal life. You can read her blog at: thriftyfrugalfun.blogspot.com. Water play is a great way to provide a natural sensory experience for kids. 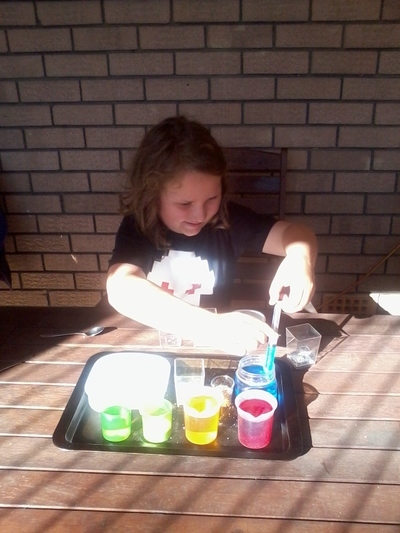 In this activity, they will mix coloured water and other ingredients to make "potions". It is a cheap and fun activity, perfect for playing with in hot weather. Outdoor: This activity is best done outdoors. Very cheap. Free if you have the items in your pantry. 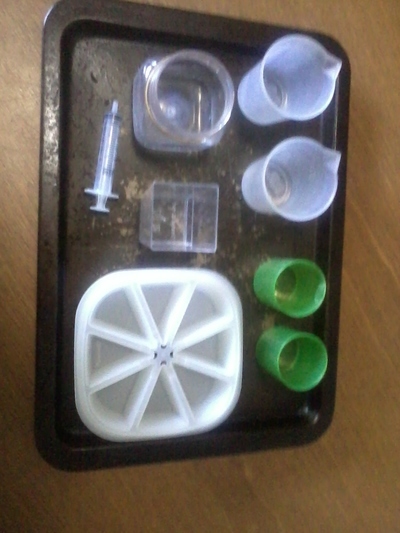 1) First place the plastic containers and other items on the baking tray. This will help catch any unwanted spills. 2) Fill a container with a couple of tablespoons of bi-carb soda, another with about 40ml of white vinegar. 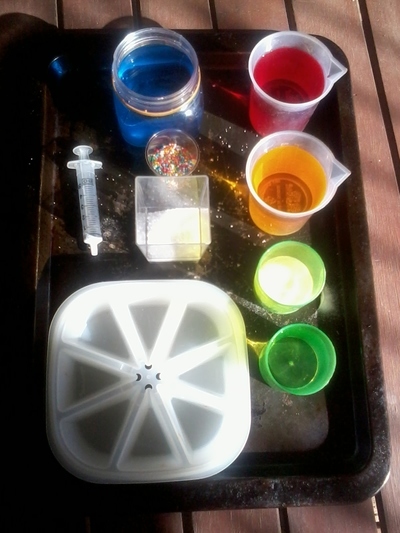 3) Fill the other containers with water and add a couple of drops of the food colouring, until you reach the desired colour. 4) Let the kids set about making their concoctions. 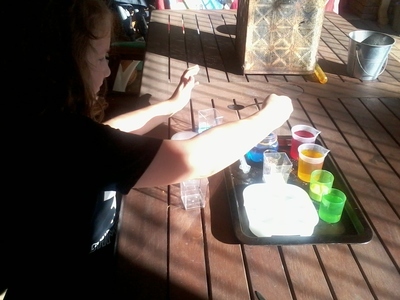 Aim: To have fun making pretend potions and introduce children to a concept of basic chemistry. Time: 5 minutes to set up. This kept my 8 year old amused for an hour or so. Great frugal fun! Players:1-2, for more kids add an extra tray with containers, water etc. Why? : This is a good science lesson for introducing acids (vinegar) and bases (bi-carb.) When you add an acid to a base it results in a chemical reaction. Making the mixture bubble and fizz-just like a real potion! Additions: You could substitute the 100's and 1000's for glitter, or add some dish liquid or bubble bath to the coloured water. Be creative. Let the kids create their own potions! Click here to find great places to visit with children. Favourite Faith No More Song?